I was on a lookout for a good free iOS game early this month and I noticed this new game from Rovio: Angry Birds Fight! We are incredibly excited to announce that Angry Birds Fight! will be launched in the Asia Pacific region on May 7th! The game will be available from the Apple App Store and Google Play, and will introduce Japan, China, Korea, and Taiwan, among other counties, to the frenzied player-versus-player gameplay of Angry Birds Fight!. See the first gameplay trailer below for a glimpse of the action! Wow! Cool! First launch in my region! I also noted that I have not posted some gaming related items here at menardconnect.com so I am sharing some Angry Birds Fight Tips and Cheats. Then first Angry Birds Fight Tip for the day will be to log in every day and go to your gift box and get your Free Angry Birds Fight Diamonds to celebrate Angry Birds Fight 1st 3 million downloads. It’s been a long time since I featured a game here at menardconnect.com. 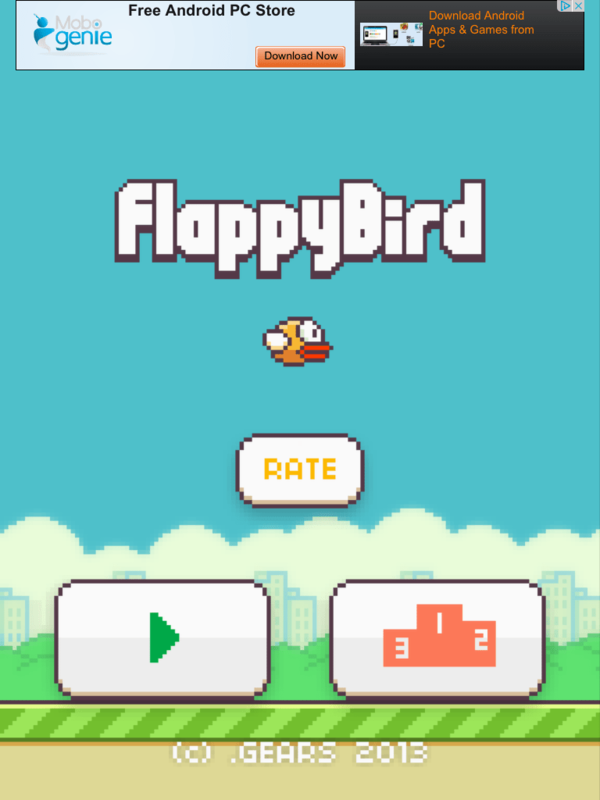 And since this Flappy Bird game is such a hit let me do some Flappy Bird Cheats post. 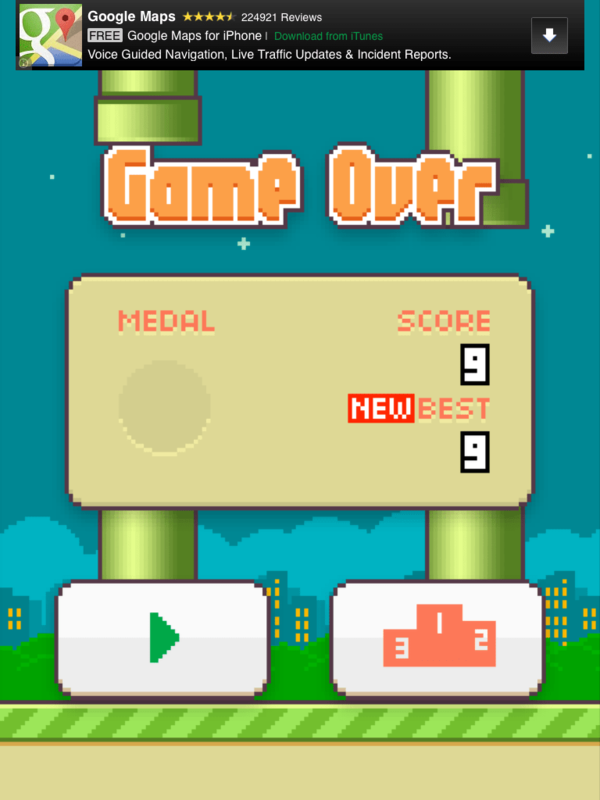 Flappy Bird is really an addicting game for most people. I am not really sure why. Maybe because its so simple and yet so difficult. The game was released last year (around May 2013) and was removed from both Apple AppStore and Google Play last week. The interesting turn of events surrounding the game Flappy Bird has had the Internet buzzing: after becoming massively popular (downloaded more than 50 million times), the developer suddenly announced that he will take down the game from app stores, and then actually did it. The decision brought the interest around the game to an even greater scale, with similar apps seen emerging in app stores, and even auctions for devices with the app installed. Its really sad to see that bad guys (read: cybercriminals) are always up-to-date on the latest buzz and trends. And they will take each opportunity to constantly make money/quick bucks on popular games (like Flappy Bird and Temple Run 2). I guess because that’s where the money is. 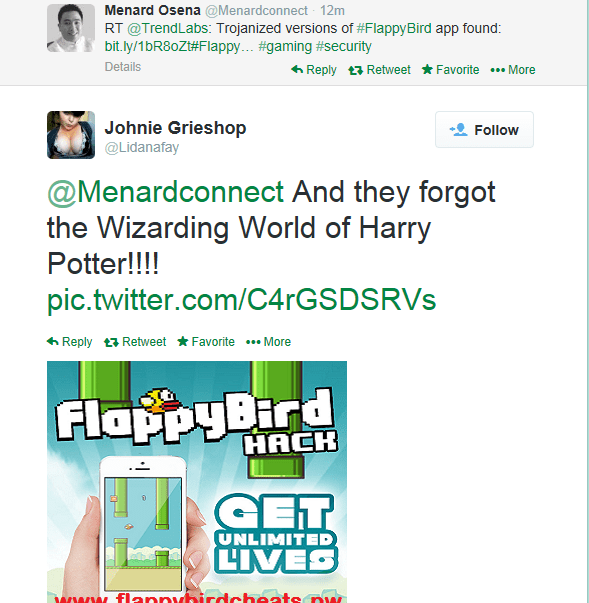 I discovered my next Flappy Bird Cheat: Twitter have its own share of Flappy Bird cheaters. By just twitting about Flappy Bird, (match it with #hashtag #flappybird) Twitter autobots will reply to your tweet offering Flappy Bird cheats and Flappy Bird hacks. Flappy Bird Unlimited Lives? What? Don’t worry I am always a responsible internet citizen and I reported these spammers to Twitter Spam Team. 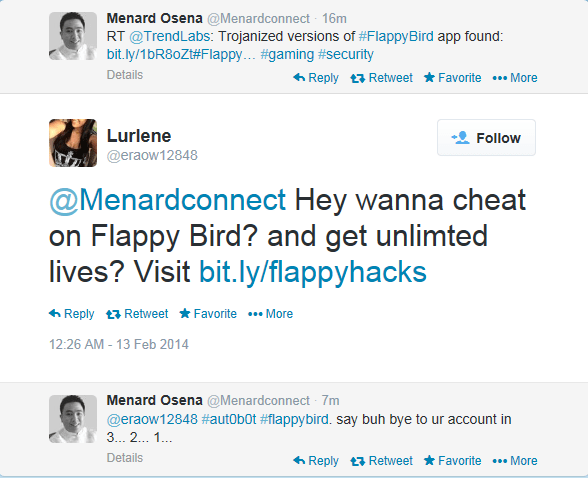 So for those looking for Flappy Bird cheats and hacks, be careful ok? Don’t blame me if you get something bad and malicious in the internetz!!! I hope you like my Flappy Bird cheat warning post. I’ve been out in the woods because of the long holiday (+ some other official work and personal tasks too) so no post for some time here in menardconnect.com. As I mentioned in the first Angry Birds Space Cheats post, the third Angry Birds Space Golden Egg is on Level 2-13. The golden egg is hidden in the plants/bushes in the planet below the planet of the sling shot. My Angry Birds Space Cheats for this level is to just hit the golden egg first and worry about the Bad piggies later. Again, when the player hit the Angry Birds Space Golden Egg, there will be a black hole animation thing for the transition to the next secret level. The player will then be transported to the Angry Birds meets Breakout Secret level. This secret level is easy! You just need to remember that just like in Breakout, the Angry Birds can bounce when you hit the bricks above and near the Bad piggies. To recap, the first Angry Birds Space Golden Egg are located in Level 1-9, as discussed in my previous post. The next Angry Birds Space Golden Egg are located in Level 1-20, as discussed in my Angry Birds meets Super Mario post. Next will be at Level 2-25. The Angry Birds Space Golden Egg is on the same planet of slingshot. Just zoom out and it is on the opposite side of the planet. Next will be at Level 2-28. The Angry Birds Space Golden Egg is hidden the snow just next to the arrow sign. Hope you like my Angry Birds Space Cheats post. My Angry Birds Space Cheats for the day is to hit the golden egg and the three bad piggies in one shot to have a Angry Birds Space 3 stars. When the player hit the Angry Birds Space Golden Egg, there will be a black hole forming up in the space in transition for the next secret level. The player will then be transported to the Angry Birds meets Super Mario secret level. To recap, the other Angry Birds Space Golden Eggs are located in Level 1-9, as discussed in my previous post. Level 2-13: Zoom out and the golden egg will be in the plants/bushes of the planet below the sling shot. This Angry Birds Space Golden Egg unlocks the Angry Birds meets Breakout level. Level 2-25: The Angry Birds Space Golden Egg is on the same planet of slingshot. Just zoom out and it is on the opposite side of the planet. Level 2-28: The Angry Birds Space Golden Egg is hidden the snow just next to the arrow sign. Angry Birds Space was successfully released last March 22 for iOS, Android, Mac and PC platforms! When Rovio announce the planned release last month , I quickly blogged about it here at menardconnect.com because I really love the Angry Birds and the Bad Piggies. And today, Rovio tweeted that Angry Birds Space reached 10 Million downloads! Wow!!! My Angry Birds Space Cheats for the day is about Angry Birds Space Golden Egg location. The first Angry Birds Space Golden Egg is on Stage 1-9. Just zoom out, and the egg is in the other planet, just below the 2 Bad Piggies in orbit. After unlocking the Angry Birds meets Space Invaders stage, you can repeat the stage and perfect it to three stars by going to the Eggsteroid Stage in the main game menu. and you will unlock the Angry Birds meets Super Mario stage. Level 2-13: Zoom out and the golden egg will be in the plants/bushes of the planet below the sling shot. This Angry Birds Space Golden Egg unlocks an Angry Birds meets Breakout stage. Level 2-25: The golden egg is on the same planet of slingshot. Just zoom out and it is on the opposite side of the planet. This Angry Birds Space Golden Egg unlocks some Bubble game that I don’t recall the name. Level 2-28: Angry Birds Space Golden Egg is hidden the snow just next to the arrow sign, and this golden egg unlocks another game that I cannot recall now (will update this post). Supposedly there is another Angry Birds Space Golden Egg somewhere as the Angry Birds Space Eggsteroids stage says 18 stars (so 18 divided by 3 will be 6 stages). I will update this post when I already have the location of the 6th golden egg. Kindly visit my other Angry Birds post here.